One of the main factors effecting engine performance is ignition timing. Static timing which covers engine idle speeds up to about 800 rpm is easily set. The timing for the rest of the rev range is down to the mechanical and vacuum advance characteristics of the distributor. These were established by the manufacturer to suit the engine specification and fuel quality at the time. Over time, our engines are mostly in the same state of tune although most owners will have a BJ8 profile camshaft or similar fitted. Petrol has deteriorated in terms of the choice of octane rating, now being 95 or 97 instead of 99 (unless you use Byford Thrust leaded which is about 100 RON). Now, the ignition may have to be retarded a little to avoid knock or pinking but otherwise the standard mechanical advance curve should still be OK. 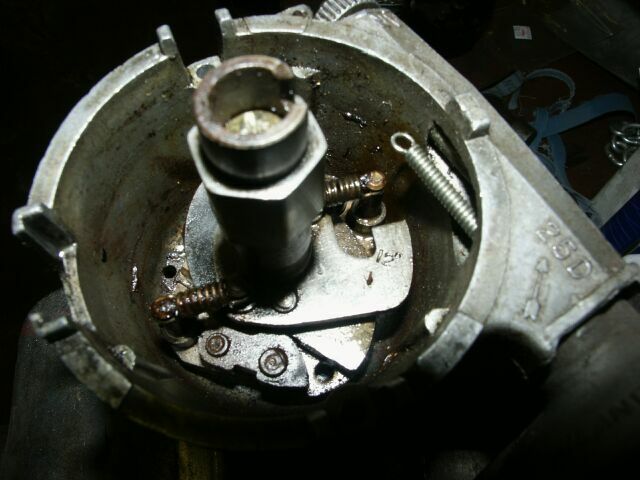 Problems come with wear in the advance mechanism, with the earlier type of Lucas distributor being far more susceptible. In terms of maximum advance there is little difference between the distributors. It is interesting to note that whilst they have been specific about the advance curve on the 25D6 this was not the case for the DM6A. Examination of the DM6A reveals that the max advance is controlled by a peg on each bob weight which locates in a hole in the action plate, thereby limiting the movement of the weights. Each of the two weights connect to the fulcrum of a small brass swivel plate, one end of which has the spring attached and the other end connecting to the cam (operating the points). The cam is therefore, one step removed from the spring and two steps removed from the weights. When new, this arrangement compromises the accuracy of the advance due to dimensional tolerances and friction in the components. The DM6A is also more susceptible to wear in it’s mechanism which effects both the rate of advance and the maximum advance. Firstly, wear between the swivel plate and the spring will result in the cam advancing too soon due to lack of restraint on the weights. This will result in the engine pinking in the 1500 to 2500rpm region. Secondly, due to lost motion in the mechanism, the weights at their limit of travel will not transmit the same degree of advance to the cam. This will result in the engine being retarded over about 3000rpm with a resultant loss in power and overheating. It is therefore, essential that this type of distributor has the weights, springs and swivel plates replaced at the slightest sign of wear. The 25D6 on the other hand, has the maximum advance controlled directly by a heal on the cam (which has the advance figure stamped on it) coming into contact with a peg on the action plate. Also the springs are connected directly to the cam. As a result, short of the mechanism seizing up, the advance curve is accurately controlled and should maintain that accuracy. The 25D6 is a much better distributor and can be fitted to the earlier cars. 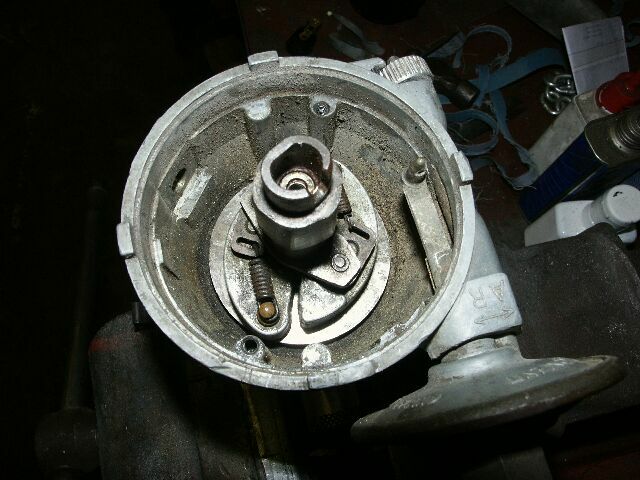 The original drive dog which includes the tachometer drive gear must be fitted; this is retained by a roll pin which is a press fit through the dog and distributor shaft. The 25D6 distributor has a shorter body that the DM6A, and must be fitted 180° out from the original orientation for the vacuum advance to avoid the steering column (RHD only). This in turn requires a top entry distributor cap in place of the usual side entry.